With another small gap in my agenda I was able to head over to the WFF park Terletse Heide on Tuesday late afternoon. The area comprises of an airfield (mainly used by glider planes) and surrounding fields. It is a rather small nature park in between Veluwezoom (PAFF-019) and De Hoge Veluwe (PAFF-005). The area is surrounded by a low fence and trees with the official entrance on the east side of the park via the airfield main building (Terlet entrance). With the limited time I had available I decided to enter the area from the west and look for a low profile corner of the park. I found a spot that was reasonably free of trees within the park's perimeter. I took a chair this time, which made the operation a lot more comfortable than previous operations where I was on foot and sat on a rock or fallen tree. There was no activity at the airfield that day (as far as I could see) and I was able to operate for 2,5 hours without seeing another soul. The weather started out rather grey but soon improved with quite some sunshine until the sun set around 17h CET. 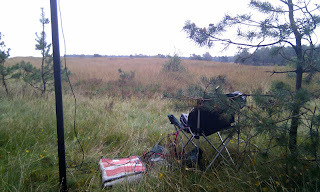 Conditions on 20m were good this day. 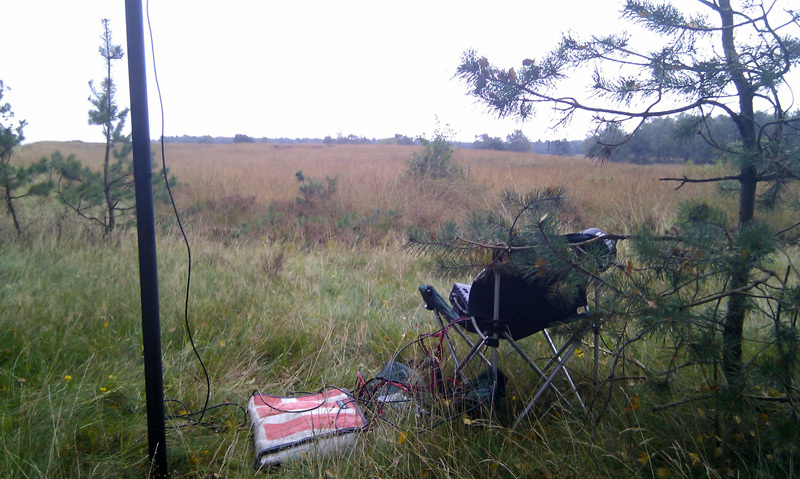 The advantage clearly being good signal reports on both ends (frequently 9+10dB or more) and a few DX contacts. The disadvantage was the amount of QRM from neighbouring stations. I started out on a frequency that turned out to be near to a DXpedition RX frequency (I learned this later from I5FLN, Luciano, who was so kind to post a spot on the cluster already at the beginning of my activation). When I moved up 10kHz the amount of QRM was manageable. My power cable was not functioning properly due to a loose fuse contact. This caused the radio to shut down a number of times at the start of the activation. Somehow I managed to fix this after half an hour or so. During the 2,5 hours of operation there were quite a number of stations visiting (227 in total), from 35 DXCC entities with DX from the US and Canada as well as quite surprisingly (to me) one ham from the east coast of China (8800km) - my first contact with a Chinese station! All in all it was a pleasant experience once again. Thanks to all the hunters for calling in.